This Rustic Hickory Backless Bench is a great accent piece for any home. Add it to the foot of your bed, in your living room, or against your entryway wall for a a unique place to take a seat. Select your seat upholstery from a large selection of heartland fabric or leather colors & patterns to personalize the look to match your home. 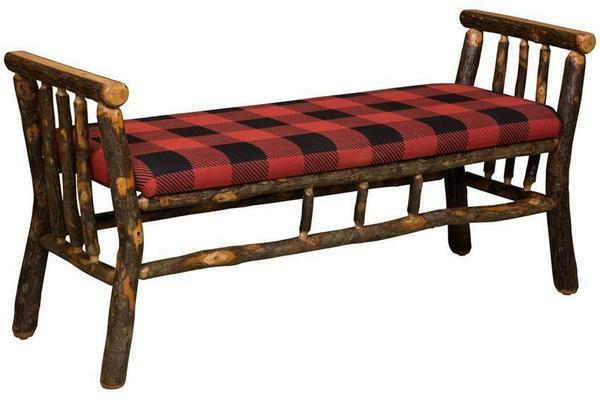 Shown in Hickory with Medium Walnut Stain and Buffalo Plaid fabric seat. Note: Buffalo Plaid Fabric is now discontinued. Please select one of our other premium fabric samples from the options above.